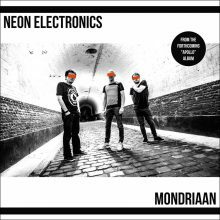 OUT NOW: NEON ELECTRONICS : MONDRIAAN In co production with ORACULO Records (Barcelona, Spain) From the forthcoming album "APOLLO" , release date april 12th 2019! NEW LINE UP NEON ELECTRONICS : DIRK DA DAVO- GLENN KETELEER - PIETER-JAN THEUNIS! PRODUCED BY GLENN KETELEER MASTERED BY ERIC VAN WONTERGHEM (PRODAM) (BERLIN) SLEEVE FOTO : NELE BREYNE Cat nr DDD30 More info coming up soon !